Take a better look at the additional displays that help give life, realism and information to the museum. and the founding of the garage trade. 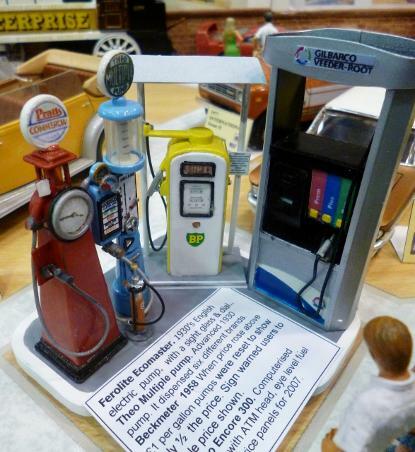 Garage forecourts have changed a great deal over the years and as have the pumps on them. As cars won’t go any where without petrol the pumps are as much a part of the automobile story as anything else. The word ‘garage’ originates from France. It refers to widened sections in a canal where barges could pass each other. The term was later used for loco sheds. It was ‘imported’, along with other French motoring words, into the English motoring vocabulary. Early garages were situated in county, and large market, towns where professional men, mostly doctors, were their customers. The garages had to be fairly close to the railway station as fuel came by rail in 2 gallon (9 Litre) cans painted in the colours of the supplier. The increase in rural traffic encouraged the opening of small country garages. The AA recognized this need building the first of several filling stations at Aldermarston, Berkshire. Oil companies saw the possibilities and followed suit. Specialist garage construction firms emerged but many corrugated iron garages were the work of local builders. These buildings were disliked and bye-laws were introduced ordering the structures to be replaced by new brick buildings, and for the roof, slates, tiles or (dangerously) thatch. Serious disputes developed between the trade and the oil companies and in 1914 garage owners complained that the price they paid left them with little profit and that the distribution was inefficient. Petrol then retailed at 1s 3d a gallon (1.4p per Litre). The trade set up it’s own distribution combine although wartime shortages made these disputes a distant memory. 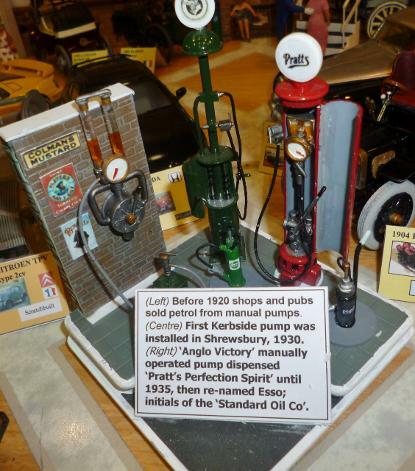 Pumps that could measure exact quantities of fuel drawn from underground tanks solved many distribution problems and the first roadside pump in the UK was installed in 1914 at Shrewsbury. The motor trade did not have a monopoly on petrol and hand cranked, wall mounted, pumps appeared outside village shops and pub’s. Electric powered pumps arrived in 1930 replacing the manual pumps and by 1938 there were around 100 pumps in Great Britain, each pump with an average throughput of 8,500gallons (nearly 39,000 Litres). 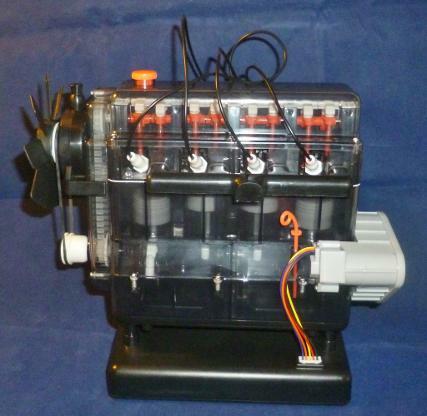 The Theo multipump capable of dispensing six different brands of fuel was the pinnacle of fuel dispensing technology. In 1922 BP petrol was 2shillings a gallon (10p a gallon, 2.2p per Litre). In 1928, after severe price cutting, it was 1s01/2d (1.1p per Litre). Prices increased again in the 1930’s and motorists vigorously protested. Then the Chancellor imposed another penny per gallon on duty in 1938, the price stood at 1s7d per gallon (1.7p per Litre) and provoked another outcry from the motorist. Their opposition was irrelevant however, as within eighteen months war had been declared and petrol was rationed. Cars don't go anywhere without a motor. 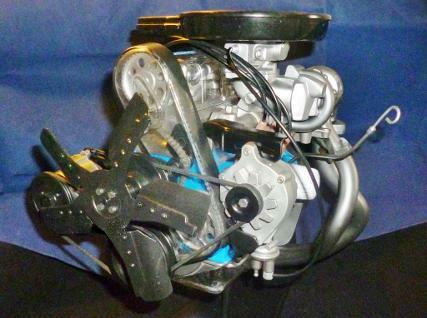 The internal combustion engine won out over steam and electricity as the best all round performance tool and much time and effort went into its design development. Many of the modern ideas we think are the latest technology actually have their roots back in the early part of the twentieth century and in truth the only new thing since the 1920s has been computer management systems. For many people the engine is the heart of the motor car, but the design approaches have varied not only over time but also between regions of the world. Most of the advances we talk about today were actually thought up in the the first thirty years of the internal combustion engine. By the 1930s dual overhead cam's, four valves per cylinder, dual spark plugs and oval piston heads had all been tried somewhere. Even forced induction, in the form of superchargers, was around. While America has favoured size and cylinders for it's power European manufacturers have relied on technological advances and tuning. 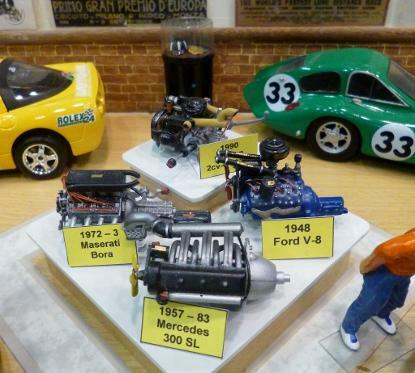 Both "Ferry" Porsche and Colin Chapman could use their fertile minds and engineering knowledge to come up with ways to squeeze extra power out of small engines. 1981 Ford 2.3ltr Turbo ohc engine. 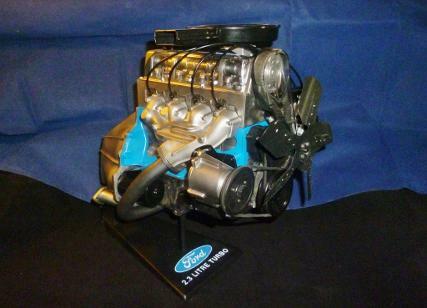 Ford’s 2.3Ltr engine started being used from 1974. 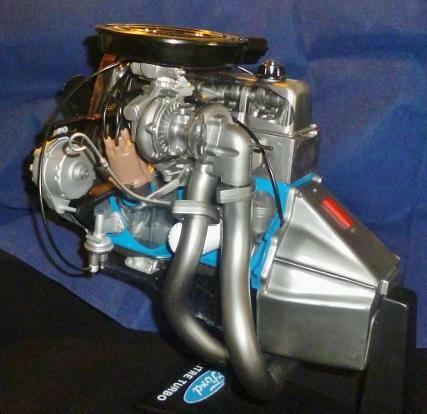 Built at the Engine plant in Lima, Ohio, and debuted in the Ford Pinto this OHC engine quickly became known as the Lima or Pinto rather than its actual design name of LL23. 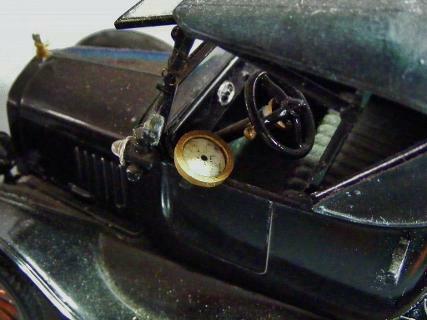 The standard N/A unit was worked over by the Special Vehicle Operations team and a high compression draw thru carburetted non-intercooled turbo version was designed. The fuel/air charge was now pressurised to 5 PSI. 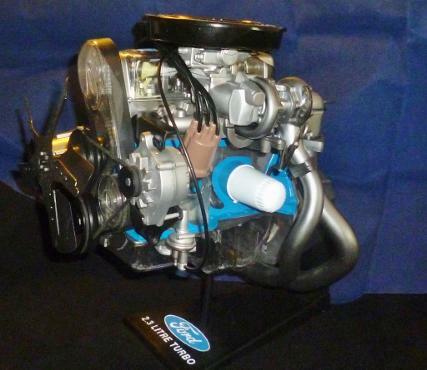 Power output suddenly jumped from 88hp to 150hp and Ford had found an affordable sporty engine good enough even for the Mustang..This unit went on sale from 1979 in a number of Ford vehicles and was evolved until finally being replaced in 1997. Revell gave us this kit in 1979 and is a very good representation of the Ford unit. Airfix have more recently given us a several engines which although not accurate representations of any particular engine do very visibly exemplify the workings of a four stroke engine. 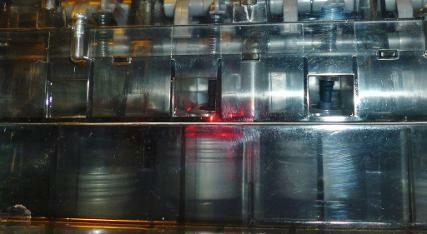 A video of this engine working can be seen on our facebook page. Click on the photo', right, to see the video. Along with the straight four cylinder working engine, a working V8 engine is also available to us. One of the most obvious ways to protect drivers in the event of accidents was to give them specialist racewear. Originally function dictated what people wore when driving but fashion soon got involved. It was only quite recently that safety became a real factor in what race drivers wore and strict rules now govern racing attire. But even that can't stop fashion and advertising keeping things colourful! While some of the 1930s drivers did wear overalls it was common to see drivers in shirt sleeves too. Linen caps were more of a nod towards smooth airflow and unruffled hair than to protection. 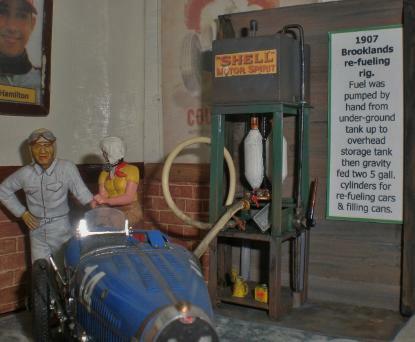 This display covers approximately 25 years, from the mid 1970s to the mid 1990s. It shows how race suites have developed although the most obvious change is in the blossoming of advertising and sponsorship logos. By the mid 1990s race suites had to have sewn in shoulder straps to help lift drivers clear of their car in the event of an accident. Latterly these have become superseded by the new seat systems which lift out with the driver acting as a spinal board. 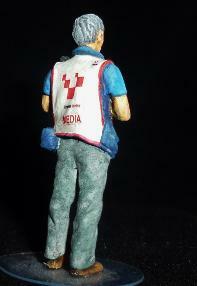 Our drivers are from commercial kits or resin figures. some of the decals are from kits while others have had to be made from scratch. With drivers having their own sponsors, as well as the team sponsors, they became walking advertising bill boards. The only patch on Nigel’s overalls that he didn't get paid to wear was the Isle of Man crest on his arm. The changes in shape through the late ‘80’s and ‘90’s were due to increased understanding of the air flow around the helmet and how it could be directed into the engine airbox intake as well as for increasing ventilation and cooling for the driver. Of course fashionable designs and sponsorship logos have had an impact here too. It is also clear that drivers helmet designs have become more elaborate as the world has become more image conscious. 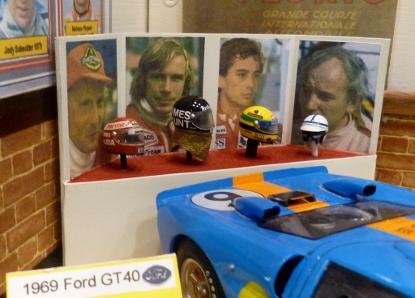 Four world champions helmets on show in the museum. Helmets have gone from motorcycle style half pots, through ear flap protection, to fully enclosing the face. Changes in materials have made helmets stronger, safer and lighter. 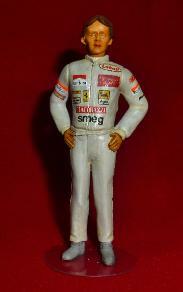 Motoring, and particularly motor racing, has provided the world with many inspiring heroes. 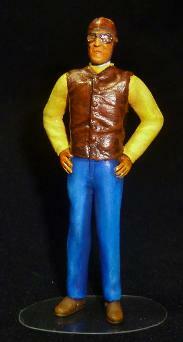 In support of our "Hall of fame" some of these historical figures have been recreated in 1/24th scale. 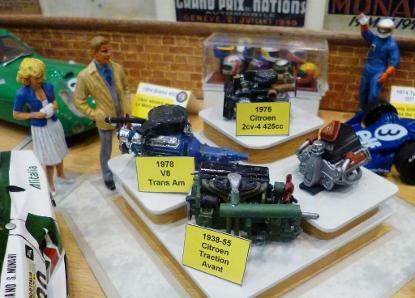 These gentlemen appear alongside their cars and friends in our displays at the model shows. 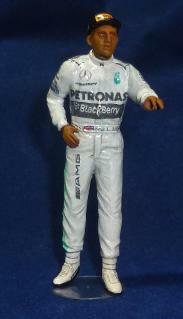 For those who don't recognise these figures we have the great Tazio Nuvolari, Alfred Neubauer, Gilles Villeneuve and Lewis Hamilton. 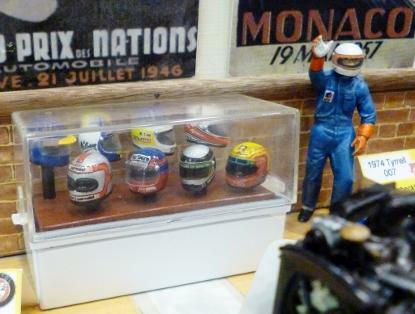 If you are able to visit the shows and see our display you might also see Graham Hill, Mike Hawthorn, Nigel Mansell, Ayrton Senna and Alain Prost; as well as many others. Trackpass TP9 was on the catalogue noted as "Jeff Bloxham". 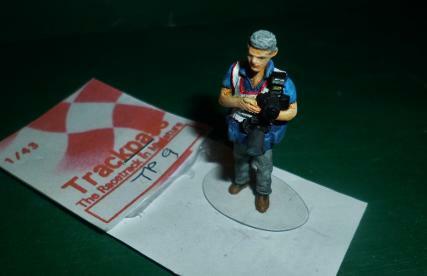 Sadly the owner of Trackpass has retired so the figures aren't available at present. 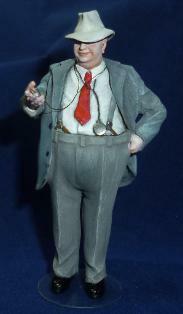 This is a shame as the figures are rather nice, and were also quite affordable. With a little time and patience they make nice figures to give a proper appreciation of the size of 1/43rd scale venicles. The methods for finding our way from A to B have changed dramatically from the first 'Route guides' to road maps to satellite navigation. However much things change we still fall back on good old road signs to keep us on the straight and narrow. 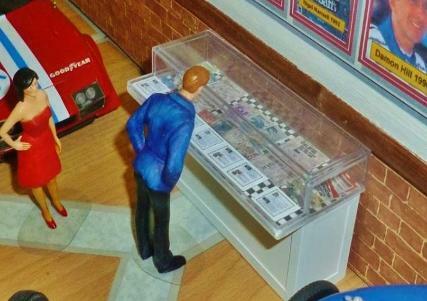 This scratch built display covers all the steps along the way and even a sat-nav too. Road signs prior to 1960 were supported by black and white poles, thereafter the posts became grey. The black and white ones are easier to see so one assumes this must have been one of those famous British cost cutting exercises. 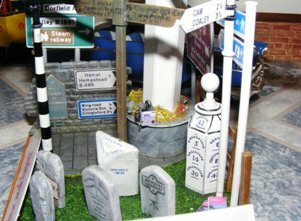 From milestones and parish boundary markers through wooden finger pointers to the modern signs and those on the road today. Many of these old style signs and markers can still be found on the roads today, and some are from our local area too. The real life locations of these signs may be of interest when you're out and about in Britain so we thought we'd let you know where they are (or were!). The large "lighthouse" sign post is from Bury St. Edmunds, Suffolk. The black and white "finger" sign with the lamp on top is from Pelsall, Staffs. The black and white signpost with the Gloster annulus atop it is from Dursley, Glos. The wood finger sign post is from Bloxwich, Staffs. For those not familiar with the U.K.'s modern sign system. Those with green backgrounds indicate 'Primary routes'. Black bordered signs indicate local routes while brown signs indicate routes to tourist attractions. Small blue signs point out pedestrian and cyclist routes, however, large blue signs (not displayed on the model) denote motorways. The mile stone at the front is from Stratford St. Mary, Essex. The white triangular 'Cheshire County' mile stone is from Alsager, Staffs. The stone to the left of the triangular one is from Minterne Magna, Dorset. The white six-sided mile stone with the ball on top is from Thaxted, Essex. The Museums 1925 Ford T now has a Jones "Live Map" installed! We tend to think that Sat-Nav is modern and the idea is innovative and cutting edge too. But the concept of a route aid is not new at all and innovation isn't either. In 1910 there was only around ten miles of paved road in the whole of America, so most of the time automobiles rolled on rutted, rock strewn, tracks known well to local people but unidentified and anonymous to the driver on a longer journey. The earliest road maps were printed in 1905 but as the road system started to evolve and new roads were commissioned these quickly became obsolete. In 1909 R.W.Jones came up with a mechanical system that worked via a cable off the odometer, or from a cable and cog system drive off the front wheel. 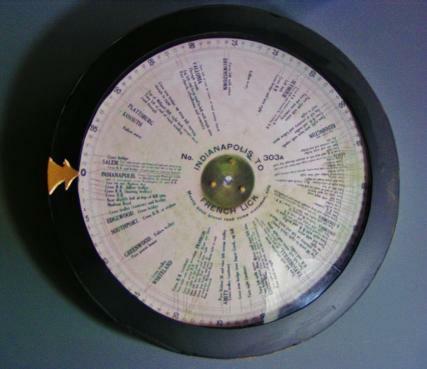 This rotated a disc with the route information inside a closed metal and glass case. Multiple paper discs were produced with many routes on supported by the The Touring Club of America. J. W. Jones idea boomed through till around 1920. By this time America was on a major road building and the road system was changing so fast the device could not keep up, sadly the idea of a device that sat on the dashboard and told drivers were to go didn't re-appear until 80 years later. 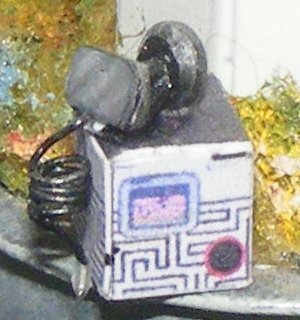 A replica of a Jones "Live Map" device has been built to give people a real idea of the machine and the sort of information it could give to a driver.